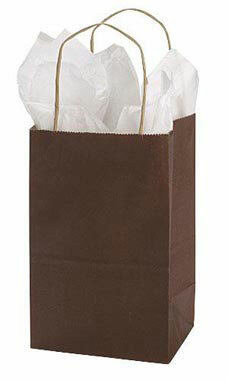 Customers will love taking home their purchases in this neutral Chocolate Paper Shopping Bag! These bags are dark brown to enhance the aesthetics in your store. Pair it with our matching packaging accessories, like tissue paper, ribbon, or raffia, and these bags transform into beautiful gift bags. Made of tear-resistant paper with twisted rope handles, these durable bags will make it easy on customers when carrying home their purchases. All of these chocolate paper shoppers feature a side gusset, making them easy for checkout counter storage. Sold in cases of 25.